It was very nice to speak with Sasha. She is quite a strong woman and a fabulous actress. I remember back when she played Kate on NCIS, and I was so upset when they killed her off. However, it's great now that she's on this show because her character is so fun and quirky. Here is the transcribed version by Gisele. - I will be going through and adding more of it later. 1. Suzanne: So I was reading about you and it sounds like you and I have the same name, Suzana? Sasha: "It's really pronounced Soo-ZAH-nuh, but nobody really pronounced it that way. Sasha is kind of a nickname for my last name in Europe. So everyone always called me Sasha -- my family always called me Sasha, so that's how it stayed." 2. Suzanne: Maura has a lot more family stuff going on now. Are you enjoying that? Sasha: "I am. I am. It's been like, you know, peeling an onion of lies and cover-ups and all kinds of things. It's pretty interesting in the sense of -- I've done a lot of research of adopted children and their feelings of their own identity. And I started doing that Season 1 when I started playing someone who was adopted and how that gave her a sense of isolation in a certain way. Then when we started to really dig in into all of this family stuff, it's been opening up all kinds of things. You know, meeting your biological family but then learning that they're not really people that you want to be around. And that's what these people are. They're very complicated. They're criminals. They're not a Sunday family dinner type, so it's been an interesting road for her. And it's fun. I like playing the drama, and I like the lightness, so this show gives me the opportunity to do both things. When we go back this year, there's a lot more drama and the mysteries are darker, so we do clearly have out lighter moments -- absolutely, there's no question, but I think that we're sort of going back to, you know, the core of the show in the books initially was, you know, was a heavier drama." 3. Suzanne: You have some amazing actors playing your two moms, right? Have you learned a lot from them? Sasha: "I know. I'm so lucky, right? Both are beautiful, talented, and very funny women, so I love working with them both. Jackie Bisset, first of all, is stunning, and she's never touched her face with any strange, you know, modern cosmetics, and she's gorgeous. I'm so impressed with her strength and ability to say no to things. She looks right, and I just think that's very refreshing. And the same with Sharon. She has the most beautiful skin ever, and so I'm always picking her brain about her creams and stuff. I learn from them. Yeah, they're pros. They've done this a long time, and they're perfectionists. Sharon asks so many questions. She's very specific in her work. She makes strong choices. So, I like to work that way, so we're a good match. We definitely look a lot alike, particularly in pictures and on screen. I think we both have big eyes and our coloring is similar. There's definitely a lot that looks similar." 4. Suzanne: What does Maura feel about Paddy and how he's protected her? Sasha: "Well, I think that she's indifferent about Paddy. I think that it's been a real emotional ride for her the last two seasons, and I think she's finally come to a place where she thinks he deserves to be behind bars. He's done a lot of awful things to people, and there's no hiding that. So, she's an honest and a good person, and she's not gonna pretend that he is. That said, he's still wreaking havoc behind bars. There's still a lot of stuff happening. Even though he is locked up, he's still managing to create problems." 5. Suzanne: When Maura learns that Hope's organization was funded by Paddy's money, does that change her opinion at all? Sasha: "It changed her opinion of Hope, because now she knows that Hope has been a part of this. Hope took his dirty money knowing it was dirty money, and she's been a part of it, so now, what level has she been a part of it? Was she not a part of it, but she's lying? I mean, we don't know. We're going to figure that out, but it's all very complicated and it just seems all intertwined. You know, at the end of it you have a love story. These are two star-crossed lovers. That's what Maura's finding out -- that her parents were a young couple in love who couldn't be together, and so it is tragic. But that said, they also made choices in their lives that weren't really honest choices." 6. Suzanne: Anything you can tell me about what else will be happening this season? 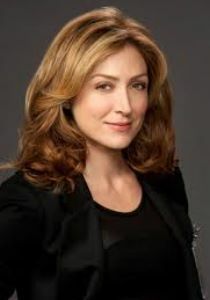 Sasha: "I do a great episode where Maura is a suspect in a murder and ends up in jail. And let's just say, she's not cut out for jail. It was a really cool episode, and very pared down to just -- it's really good. There's a new character of Lt. Martinez, played by Amaury Nolasko, who is someone from Jane's past. Maura has a potential love interest. He's a bomb-squad tech. His character's name is B.T., Brandon Thomas, played by Eric Winter. He's wonderful and really talented, and he and Maura have a very nerdy connection. He's also kind of a science geek, and it is kind of fun to see her have someone who is light and I don't think is a potential serial killer. We have a lot of fun stuff. Jane and Maura are still -- they have a new yoga room that they play around in. Maura is really trying to get Jane to kind of be a little healthier in her life and eating. So, we shot a lot of fun stuff throughout the season." Don't forget to watch "Rizzoli & Isles", which premieres Tuesday June 25th on TNT! It's very enjoyable.